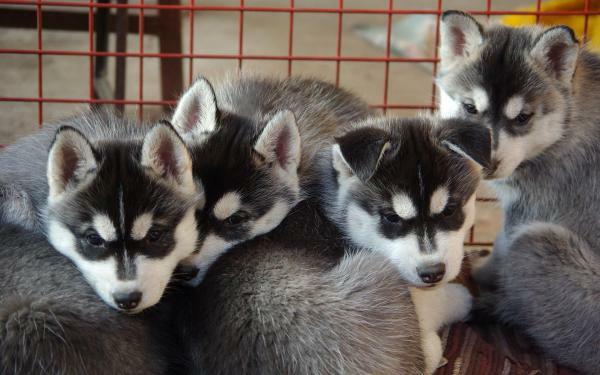 Description :Here we have great chunky pups for sale mom and dad can be seen mom is a shortleg Siberian Husky, the dad is a Pomeranian dog smaller and has teacup in his pedigree, they are wormed and fleaed and have been bought up in the family home,Here is our adorable first generation pomsky pups born and raised in my family home alongside their mum these little beauties have had no expense spared given the best start in life raised on royal canine puppy food and puppy tripe also they have been on a drontal worming program from two weeks old they will also come with their first vaccine and a complete health check just to make sure they're in tip top condition to see them of to their new homes mum is my small Siberian girl very well behaved and has a great temperament We own her and she will be here to see on arrival with her puppies father is my friends Pomeranian dog great example of a Pom excellent temperament also their is a variety of colors both boys and girls. any more info required email or call me thanks for looking - Vaccinations are up to date - Microchipped - Fully flead and wormed - Has already had a few training sessions - They are bred by a very nice family here. they are extremely intelligent, well behaved and friendly pups and we are looking for a permanent home for them with a nice family. We also have a lot of accessories such as bed, a lot of toys etc. that we will also give to you.If you want more information/ are interested in buying any please do contact me.